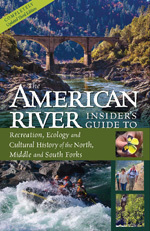 ﻿﻿﻿﻿This thoroughly researched guide provides a wealth of knowledge for exploring and appreciating the American River canyons. Filled with insider secrets on where to go, how to get there, when to visit and what treasures to look for, this guide invites you to come and explore the easily accessible wilderness of the Auburn State Recreation Area no matter what your age, interests or abilities. 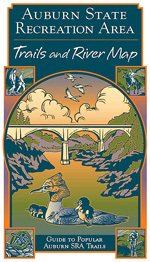 The new updated American River Trails Bandana Map featuring the popular trails in the Cool, China Bar and Confluence Areas is an important hip pocket addition for all that enjoy these outstanding trails in the Auburn and Cool areas. Designed by Kathy Trauman of Cool Trails Maps in collaboration with PARC, the easy to use map highlights the Wendell T. Robie, Western States and Olmstead Trails. It is an essential guide to help untangle the labyrinth of connector trails including some obscure historic routes used by gold miners and homesteaders. Bandana size is 22" x 22". It is screen printed on 100% cotton. ﻿﻿﻿Two versions﻿﻿﻿ of the map are available. 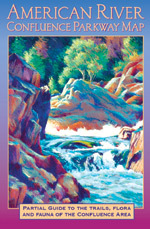 PARC's new easy to read full color 20" x 28" American River Trails and River Map is an essential guide to the popular and lesser known North & Middle Fork trails in the Auburn State Recreation Area. Mystic Design's Laurel Mathe illustrated this map that features a comprehensive legend key to roads, trails and museums, whitewater boating information, campground information, useful park visitor information and regulations, Native American and Gold Rush history, trail tips, visitor resource contact information and resource guides and a river-canyon ecology profile. PARC's proposed California Wild & Scenic designation for a sixteen mile stretch of North Fork American River is highlighted. Finally, the map is sprinkled with flora and fauna illustrations from Law's "Field Guide to the Sierra Nevada". PARC's American River Confluence Parkway Map & Brochure is a partial guide to the popular trails and flora and fauna of the Confluence Area. The ARC Park Map, drawn by Tom Petersen, features the roads and trails located in the Auburn dam site area now designated by California State Parks as the China Bar Area. 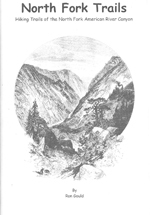 The brochure side of the map offers a river-canyon profile with illustrations from John Muir Laws' "Field Guide to the Sierra Nevada" book. The ARC Park map also contains important historical facts, contact information and a partial list of ASRA Park rules and regulations. Mystic Design, who create the beautiful Confluence Festival art work each year, designed the ARC Park Map and brochure for quick easy reference. You can also view the map side of the brochure here. Practical trail guides for bikers, equestrians, and hikers. 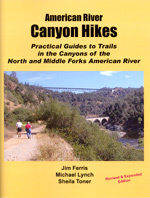 This book makes quick work of selecting and finding enjoyable trails in the spectacular American River canyons near Auburn. The book includes 24 trail guides, and a convenient index to facilitate selecting an apporpriate trail based on designated usage (biking, hiking, or equestrian), locations, distance and difficulty rating. Specific directions to trailheads and trailhead parking as well as what you may expect to encounter along the trail. Also included is a description of the self-guided Confluence Interpretive Trail, which reveals a wealth of information about the history, geology and vegetation of the incredibly diverse confluence area. Your guide to the best hiking near the Georgetown Divide. From Cool to ﻿﻿the Desolation Wilderness. 42 hikes, 6 hiking areas, and 27 maps. 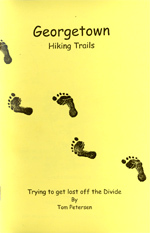 with historical information, trail descriptions, and hiking tips. Printed by Get Off Your Gass! Proceeds from this book are used to help maintain our local trails and keep them safe and available for eveyone to enjoy. 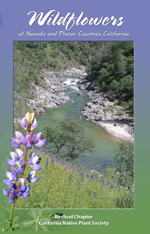 Ron Gould's trail guide to the North Fork American River trails from the Sierra Foothills to the Pacific Crest provides accurate trail access information and descriptions. For those seeking to explore the wild and scenic beauty and colorful mining history of the canyon or to walk on paths first used by Native American's migrating seasonally back and forth over the Sierra, this is an essential guidebook. Many obscure trails are included in the guide to encourage maintenance so that they are not lost to time! From the Great Valley grasslands to the rocky mountain peaks, northern Sierra Nevada wildflowers enchant all who stop to enjoy these gifts of nature. This versaltile new guide describes 520 species of wildflowers found in Nevada and Placer Counties, illustrating the plants and their diverse habitats with over 600 color photographs. Useful well beyond this two-county region, the area's complete plant checklist inludes 38 percent of the plants known to grow wild in California. Casual wanderers and avid botanists will appreciate the thorough plant descriptions, organization by plant families, Native American uses, and tips on places to see wildflowers. Plus, look for wildflowers along 21 of the most accessible trails in Placer and Nevada Counties - driving distances and GPS coordinates included. Describes and illustrates with color photos over 200 species of trees, shrubs and woody vines growing in Nevada and Placer Counties - a small but widely-diverse segment of California rising in elevation from valley grasslands and foothill woodlands up through mountain meadows and conifer forests to the east side of the Sierra Nevada. Useful to backyard observers and casual hikers, as well as serious students and knowledgeable native plant enthusiasts. A versatile and accessible guide with clear botanical descriptions, anecdotes for the curious, reference to insects and wildlife, and a list of places to see trees and shrubs of all varieties. 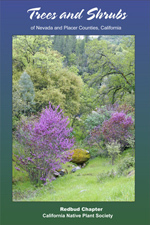 Published 2014 by the Redbud Chapter of the California Native Plant Society and CNPS Press. An invitation to celebrate California’s heritage and culture weaves through LIVING WILD, an essential guide to the uses of native plants. This expanded 2nd edition offers a deep awareness of the landscape with advice on cultivating more than 100 native plant species and enjoying this natural abundance for sustainable wild food cuisine and herbal medicine remedies. LIVING WILD is the only sourcebook that provides a simple path to fundamentally shift the way we eat, garden and heal. 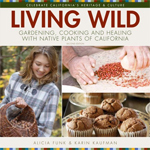 100% of LIVING WILD book profits go to support the California Native Plant Society, www.cnps.org. 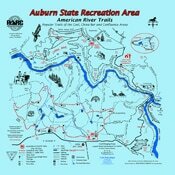 The Auburn State Recreation Area Topographic Trail Map created by Sowarwe-Werher is a comprehensive guide to the hiking, bicycling, equestrian and whitewater routes found in the park. Each trail is numbered and a map key refers park visitors to the type of recreational use allowed by CA State Parks on the trail. 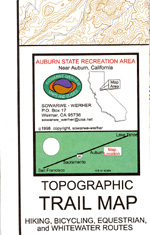 The map's topographic orientation provides valuable information on elevation changes. Map icons also identify facilities and services. NOTE: The map does not include the recently opened China Bar Area.